One Button Benny is a story about heroes and the unlikely places you find them. With strikingly beautiful retro-style illustrations by Chloe Holwill-Hunter. 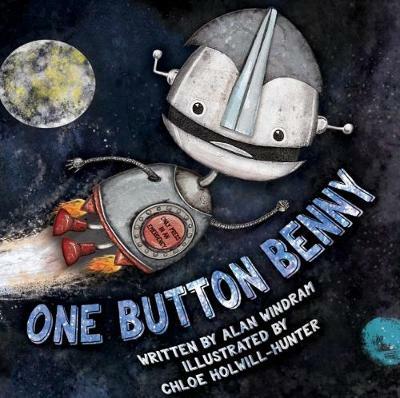 This colourful, fun tale for three-to six-year-olds, sees loveable robot Benny becoming a surprising hero when the hairy, scary collectors try to take over his planet. Benny has always been different. An outcast. He can’t do the cool things that all of his robot friends can do. All he has is one button that he is not allowed to use except in an EMERGENCY. He doesn’t know what it does. But all of his friends can do amazing things with THEIR buttons. Thus they tease Benny a lot and treat him differently, often poking fun at how boring he is. I felt very sorry for Benny but I loved that he still tried to find ways of using his emergency only button within the book. But then a REAL emergency happens and while all the other robots flee, Benny finally gets to press his button! And it is the coolest button of ALL the robots. Within moments the robots all apologise and all decide that they want to be Benny’s friend and Benny feels welcome and happy. He’s not just ordinary after all, he’s EXTRA-ordinary. This book had a very “ugly duckling” feel to it but I did not mind this at all as I just really loved the book. I loved the way the words were easy to say out loud, I loved all of the amazing illustrations by the ever talented Chloe Holwill-Hunter and how they related so well to the story as well. I loved how all of the robots looked different from each other and were all really unique and yet how despite that it still managed to reflect our world really well. But when the sun is shining, the food is delicious and the air smells of honey, anything seems possible. Will the magic of Provence help Faye finally find a happy-ever-after of her own?. In 1930 nine-year-old Miriam travels by train from Brooklyn to her grandparents’ farm in upstate New York. Her grandparents are kind, generous people, but they aren’t exactly ideal playmates for a lonely girl. When Miriam is not doing homework in the kitchen with Bubby or helping prepare meals for the migrant workers that Zayde hires to help out on the farm, she plays with the barn kittens born just before she arrived. Those kittens are her only friends, until the day Miriam discovers a young girl hiding in the barn. Cissy and her brother, Joe, who’s one of Zayde’s farm hands, are on the run from an abusive uncle back in Mississippi. Miriam and Cissy hit it off immediately. But their friendship is tested when Miriam is forced to choose between keeping a promise and doing the right thing.What were your initial thoughts on the book? My initial thoughts about the book were that this book was a totally different style and by a totally different author to what I usually read, which means that I may not like it, but I was wrong. I really did enjoy the book more than I thought, it is one of my very favourites, and despite it having 25 long chapters I finished it in only 2 days. I wish I had cheeked how many chapters there were so I could have savoured each sentence carefully instead of reading for hours and hours like I always do! I have two favourite characters, Mariam and Cissy, because they are both very easy to like. They are brave, kind and funny but their lives are very different. Mariam has a great life in a warm house with food to eat whenever she is hungry however not all of us have a home, food or water and one of these people in this book is Cissy. Mariam and Cissy might have opposite lives but that makes them perfect for each other. I would recommend this book to older readers around the age 10 or readers that enjoy books set in the past. Summarize the book in one sentence. A nice book about unexpected friendships that you will enjoy. Another great adventure with Poppy and her friends and I think this one is my favourite mystery so far because there are actually 2 different mysteries, could they be linked together? I really enjoyed reading it especially after the cliff-hanger in the second book about Poppy and her birth mother. My favourite character is still Poppy because she is brave in every possible way. She handles mystery very well, especially the really scary ones, she listens to her friends even if she is the leader of the group, takes their ideas into the adventure, even if she might not agree with them and, most importantly, she stays a loyal friend to them even in the hard times. I would recommend this book to anyone that enjoys adventures and mysteries from ages 9 up, especially if they aren’t scared easily because this one is a bit scary. A great adventure that leads to more mysterious events in every chapter.